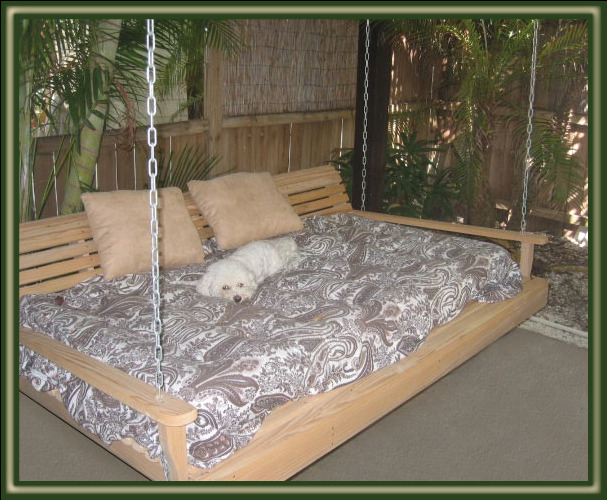 The Cypress Moon Swing Bed is our largest swing, large enough for the average person to take a nap on! This beautiful 6 ft. bed is built from Louisiana cypress and features 1 inch thick x 1 3/4 inch wide cypress slats, routered (no sharp edges) and finish sanded on all sides for your safety and comfort. The slats are screwed to the frame (not nailed) and the frame is bolted together with 5/16 inch bolts . The bottom of the swing is contoured with a tapering curve to the outer edge. 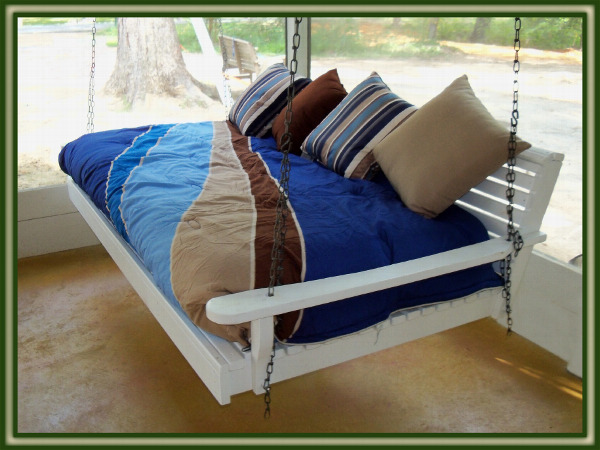 Perfect for indoor or outdoor use, the dimensions of this Porch Swing Bed will accommodate a twin mattress! Available unfinished or your finish choice of 8 color STAINS. As with all Cypress Moon Furniture, price includes FREE SHIPPING! *PLEASE NOTE: If you plan to put a mattress on your Swing Bed, you may want to request it without the contour in the seat. Other wise, it will feature a contoured shape. *Mattress not included with your Swing Bed. WHY COLOR STAINS & NOT COLOR PAINTS? We only offer color stains because the grains of the cypress are too beautiful to be covered up by paint. By staining them we are still able to uniquely accent your rocker with color, while allowing the grain to remain visible!